Last year after much deliberation I decided to welcome an Elf On The Shelf into our home. His name is Griswold and you can read about my decision to "adopt" him here. Since we've made the decision to not follow the book that came with our Elf, his activities are a bit different than others. He does not get into mischief or misbehave, and he does not spy on us. Griswold comes every year to suggest fun family activities, good deeds, and brings little treats throughout the holiday season. A lot of these activities are things you probably do in the winter regardless, but having your Elf present the ideas to the kids brings a little bit of holiday fun to your home. We start our Elf adventures with the welcome poem! You can find it HERE. We made the decision not to follow the regular Elf On The Shelf book, so I wrote my own poem and had it printed and laminated at Staples. Your Elf can surprise the kids with a fun filled day outside. You can also save this one for when they actually have a snow day at school. Treat the kids to new sleds or crazy carpets, shovels, etc and have your Elf present it to them when they wake up! Set your Elf up with a new movie and some yummy treats for the family. Make sure to leave a note from the Elf telling them all about family movie night! If you prefer to see a movie in theatres, a gift card with a note would be a nice alternative. 4- "Let's Buy A Toy For A Child In Need"
Have your Elf hold a note suggesting that you go buy a toy for another child who may not get a lot for Christmas. Take the kids to the store, give them a budget and let them pick out what toy they want to give. 5- "Let's Take Some Treats To Your Class!" For this one, your Elf could be sitting amongst some treats (cookies, cupcakes, etc) with a note telling your child that they get to take the class a treat. Most daycares and schools require store bought treats, and please take into consideration any allergies that may be present. Your Elf could surprise the kids with some new craft supplies to make holiday themed crafts! Pom poms, glitter, popsicle sticks, paper, glue etc. Pinterest is great for ideas on different crafts you could do- or you can have the kids make whatever they want! 7- "Let's Go Ice Skating!" Surprise the kids with a day at the rink, followed by hot cocoa! I love creating scavenger hunts and having them printed and laminated to use again and again. A Winter scavenger hunt could be a walk where you search for certain items outside and see who can find the most items on the list. If you have more than one child you could break into teams and see who can find their items first. You don't have to physically bring home the items- some of them you can take photos of, or listen for. Check off each item with a dry erase marker as you find them. Some things you could include one the list are pinecones, animal tracks, berries on a branch, an evergreen tree, an acorn, Christmas lights, a snowman, listening for birds, etc. 9- "Let's Make Christmas Tree Ornaments!" Every year we go to our local Clay Cafe to make our annual family Christmas tree ornaments. If you have something similar in your city, it makes for a fun afternoon outing. If not, you could have your Elf provide the necessary supplies at home to make ornaments. Supples could include: popsicle sticks, glitter, glue, string, pinecones, etc. 10- "Do You Want To Build A Snowman?" Provide the kids with all the necessary items to build their own snowman! You're going to need a hat, scarf, something dark for the eyes, mouth and buttons, branches for arms, and a carrot nose of course! 11- "Let's Write A Letter To Santa!" Have your Elf surprise the kids with their very own letter writing station! Include fun Christmas paper, envelops, markers, glitter, stamps, etc! 12- "Let's Buy Food For Someone In Need"
This could be donating to your local food bank or shelter, or buying for a local family in need. Take the kids to the store with you and buy food items for someone in need. You could also include a lesson on budgeting by telling them how much you have to spend and seeing how many items you can buy with that amount. Since this is the holiday season, you could even purchase ingredients for a full Christmas dinner for a family who may not be able to buy them on their own. 13- "Let's Deliver Christmas Cards To Our Friends And Family!" Present the children with a gift bag full of already addressed Christmas cards, and announce that you're going to be delivering and mailing cards today! Talk about how much getting a Christmas card will brighten someone's day. Along with delivering to friends and family, it's nice to include people you may not always give cards to, such as a neighbour, mailman, garbage man, etc. Follow the card delivery by taking the kids on a special hot chocolate date at your favourite cafe. 14- "Let's Learn About The Meaning Of Christmas!" It's story time! Get comfy and teach the Children about why we celebrate Christmas! This could include a telling of your own, or a book reading. We also have the Little People Nativity Scene that we LOVE- so we plan on including that in our story this year. On December 1st, have your Elf present the children with their Advent Calendars! Most stores sell the inexpensive chocolate ones, but I personally love the ones with a little toy for each day (Thomas and Friends, Lego, Playmobile, Etc). You could also make your own! Hit up the dollar store for some kid sized aprons & new baking utensils for each child and have a holiday baking day! This is a great way to get the kids involved in helping with the holiday baking, and you'll end up with lots of treats to take to Christmas dinner or snack on over the holidays. My 3.5 year old is majorly into puzzles right now, and inspired my idea for a holiday puzzle night! Grab some snacks, throw on a Christmas movie, and sit around the coffee table to work on holiday themed puzzles together. It's time to take pictures with Santa (or Santa's helper)! Have your Elf present the kids with a new Christmas outfit and a note about visiting with Santa. Wrap your elf up in wrapping paper or string and have him/her suggest that they help mom & dad wrap presents! They obviously can't wrap their own, but they can help wrap gifts for other family members, their teachers, etc. For toddlers, this is a great time to learn about using safety scissors and tape- and toddlers LOVE to help! 21- "It's Time To Decorate The Tree!" I loved decorating the tree as a kid. If you cut down your own tree, you could make a day of it by going to the Christmas tree farm in the morning, and spending the afternoon decorating. If you have an artificial tree, have the kids help by decorating with the non-breakable ornaments and the ornaments they made themselves. 22- "Let's Collect Some Change To Donate!" Have your Elf "give" each child their own ziplock baggie and see who can fill it with change first. This can take place over a week or the entire month. Once they have full baggies, let the winner choose where to donate the change to. As an early present, have the Elf present the kids with 1 wrapped book each! Later that night you can have a Christmas story time by the tree before bed. Falalalalalalalala! Grab the kids and serenade the neighborhood. Or just visit people you know and family- your call. 25- "Let's Donate Our Unwanted Toys!" Before Christmas is the perfect time to clear out old toys! You can donate them to children who don't have a lot, and it will make space for any new gifts coming into the house. 26- The Christmas Eve Box! It's your Elf's last night and he wants to leave the kids with something special! I'm sure you've seen Christmas eve boxes all over Pinterest. We plan on making one this year ( I'll link the post once it's made). You can add anything you want to the Christmas eve box. In ours, we plan to include: New Christmas PJs, a Christmas book, a new holiday beanie boo, a new Christmas blankie, snacks, hot chocolate, the plate and mug for Santa's snack, and reindeer food. 27- "Here's A New Book For You!" Throughout the month our Elf likes to bring books wrapped in wrapping paper. 28- "Let's Make Holiday Ice Cream!" We love making our own ice cream, and holiday flavors are so fun! Gingerbread, candy cane, eggnog, cranberry and vanilla, etc. The sky is the limit, and kids will have so much fun adding the ingredients and trying it when its frozen. 29- "Let's Donate Some Books To Our Class!" It's always fun donating items you no longer need, but especially nice when it benefits your child's class! The teachers would appreciate the donation, and your child will feel a sense of pride from helping out. 30- "Let's Write A Christmas Story!" Your Elf can present the kids with their own notebooks, pencils, crayons, and anything else they need to write their own holiday story! If your little one is too young to write, like mine is, you can write the story for them as they tell it and have them do the pictures. 31- "Surprise, It's Your Advent Calendar!" This year we made our own advent calendar (I'll link the tutorial here once I post it), but you can give them any kind of advent calendar you want. 32- "Let's Help Shovel The Driveway!" New little shovels and mittens for everyone! Make shoveling fun with new winter gear and the promise of hot chocolate when you come in. 33- "Let's Make A New Board Game!" Pick up some cardboard, dice, and any other fun art supplies you need to make a Christmas board game! Have the kids make up the rules and have a family game night. 34- "Let's Put On A Christmas Play"
Set the stage for fun and provide them with Santa hats, elf shoes, reindeer antlers and whatever else they may need to perform a Christmas play! Make learning to count into a game by providing some Christmas themed flash cards, and candies for counting (and snacking). 36- "Let's Decorate Your Room For Christmas!" Lights, garland, a mini tree perhaps? Or have the kids make their own decorations! 37- Holiday Helper! "How Many People Can You Help Today?" Have the kids keep track of their good deeds for the day and talk about it over dinner! There should be no prize for doing this, as good deeds do not require a reward. 38- "Let's Make Reindeer Food!" 39- "Let's Donate Some Warm Clothes!" Take the kids on a shopping trip to pick out some warm hats, glove, scarves, socks etc for someone in need. 40- "Let's Have A Tech Free Day!" Turn off the phones and tablets for a day and try out some new board games, work on puzzles, etc. I love holiday themed clothes! If your Elf is going to be giving gifts here and there, new Christmas shirts are fun and practical (okay maybe just fun). 42- "Let's Make A Gingerbread House!" This is such a classic holiday tradition! Christmas baking is so much fun! Set up a cookie decorating station at the table with bowls of sprinkles, icing, candies, etc. 44- "Let's Make Paper Snowflakes!" No two snowflakes are alike- especially the paper kind! Jazz them up with some glitter, paint, etc. 45- "Let's Paint Ornaments For The Tree!" Most dollar stores sell ornament painting kits for kids, and they're so cute and fun! Personal homemade ornaments make great family memories to look at every year, or awesome gifts for the grandparents. 46- " Let's Give The House A Christmas Cleaning!" There's nothing like a clean house before Christmas! Use dollar store items to make each child their own cleaning bucket. You could get spray bottles, cloths, sponges, dusters, etc. 47- "Let's Get Some Gift Cards For Our Friends!" Take the kids to buy coffee shop gift cards for the mail person, garbage man, crossing guard, etc. Grab a large empty box and their favourite stuffed animals or puppets to put on a fun puppet show for the family! Grab your tent and set up camp in the living room! Grab lots of cozy blankets and pillows, throw on some holiday movies and sleep under the stars- uh I mean Christmas lights. It's time to get ready for Christmas dinner! This one is great for older kids! Hold a friendly competition to see who can make the best side dish for Christmas dinner. The winner gets extra dessert. I hope you've enjoyed these Elf On The Shelf ideas! Comment below and let me know what your favourite one is! These are such great ideas! I’ll have to come back to this if we ever decide to do the elf. 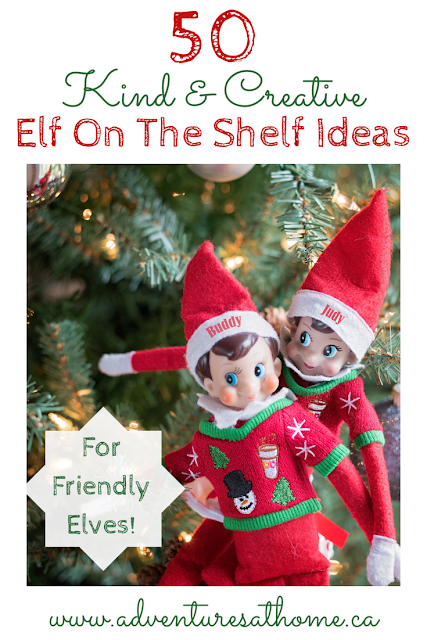 I don't do ELf on the Shelf but these ideas look really cute. These are some amazing ideas you shared here and yes we do make snowflakes from paper every year. I just love to involve kids in such creative works its so much fun !